Featuring new sheer cotton jersey fabric -- lightweight and stretchy for a perfect feminine fit! Soft and comfy black shirt stock from Bella with short sleeves. Rich durable silk screen front and back. 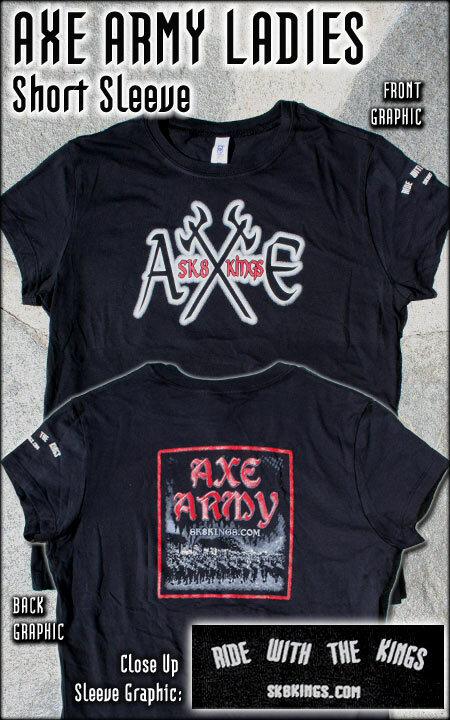 Our original AXE logo is front and center, the back is screened with our "AXE Army Racing Legions" graphic and the left sleeve is printed "Ride With the Kings". Available in three sizes -- small, medium & large - black only.